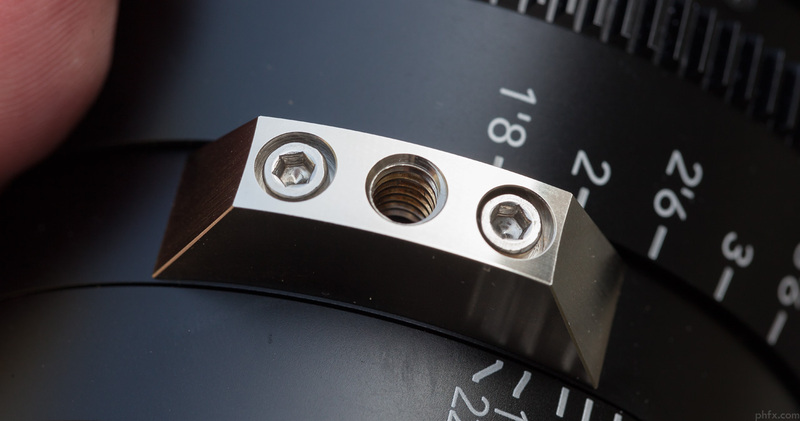 A couple days ago Ryan Avery of Schneider Optics contacted me and informed me that he had a set of prototype Schneider Xenon FF-Prime Lenses. He also asked if I'd like to test them out for a day and mentioned I might be the first to shoot any images with them. Being the lens nut that I am and my new fondness of the Cine-Xenar III lenses I certainly couldn't pass that up. Below are a few of my thoughts regarding the lenses. I only had about 4 hours of shooting and inspection time with them, but I tried to get as much done as possible. Consider this a "quick preview". 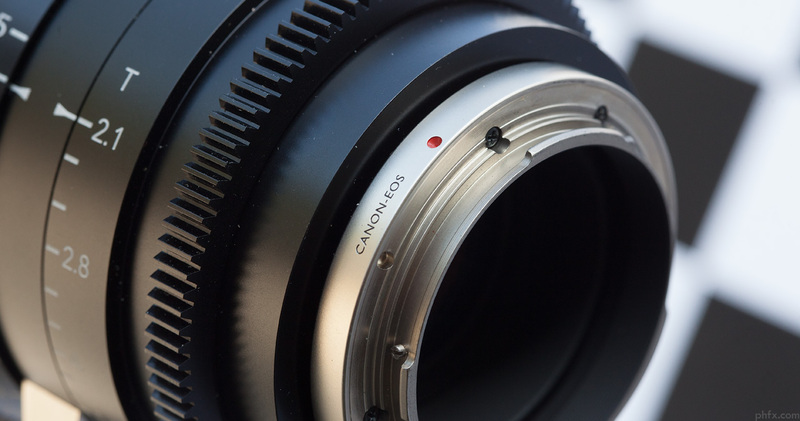 These lenses started their life when they were announced and shown as the Video Xenons, however, much has changed during their product development and these lenses are indeed finally coming to the market at the end of this year as Xenon FF-Primes. 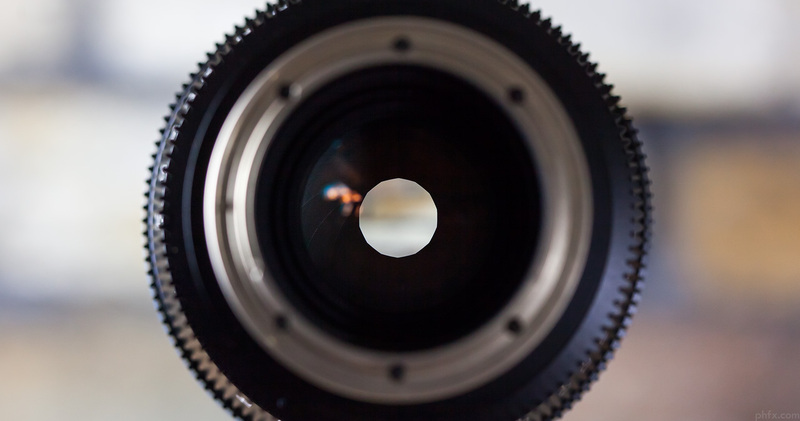 Matt Duclos provided a nice preview of these lenses on his blog here. He also was able to put the lenses up on the projector and make some observations about the lenses a couple days ago. I'll add the link right here when his article is up. 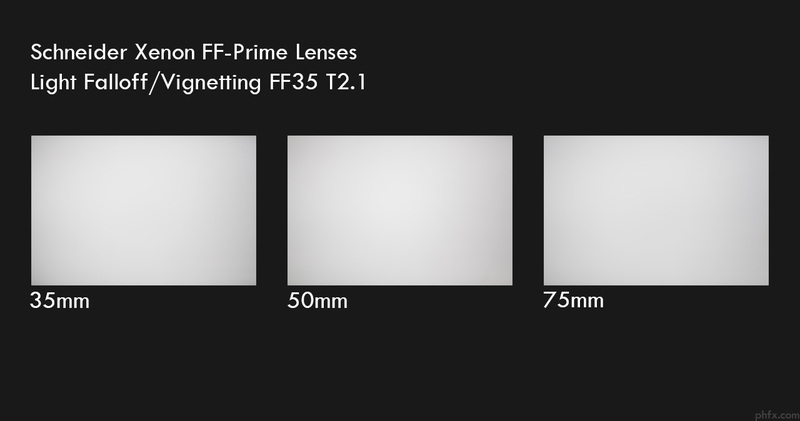 The most notable thing about the new Xenon FF-Primes are that they are designed to cover FF35 (36x24mm). That puts them up to compete squarely against Canon CN-E Primes and Zeiss CP.2 Primes. However, the exciting thing about these new Schneider Xenon FF-Primes is that they are not simply based on still lenses. 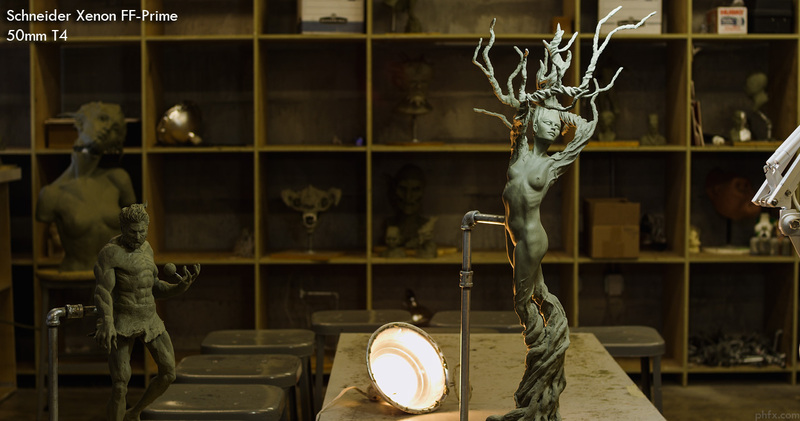 They have been designed from the ground up to be proper cinema glass. As such, they avoid some of the weirdness that isn't exactly desirable that the CN-E, CP.2, and other still lenses capture when used for motion pictures. 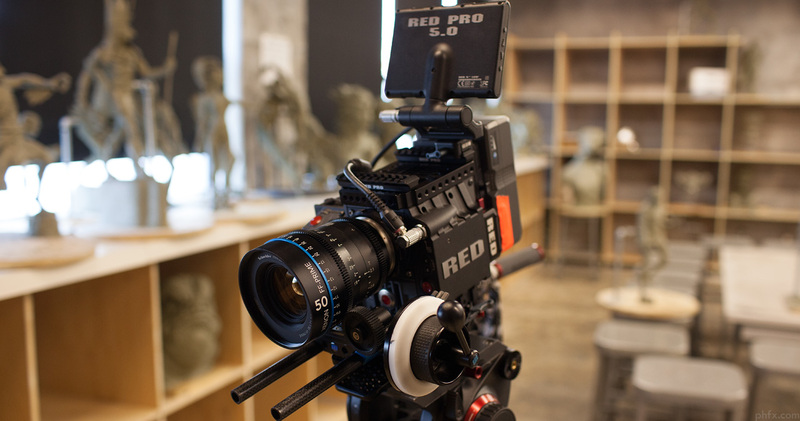 The initial set will consist of 35, 50, and 75mm primes with more focal lengths on the way. The very first thing you'll notice when you hold one of these lenses in your hands is that they are very well built. These are not toys, they are tanks. Clearly the Xenon FF-Primes have been designed to stand years production use and abuse. They are very solid and feel like a solid piece of metal and glass. That's great news. I opted to test out the Canon EOS/EF Mount version to allow me to check out the full frame coverage. The first thing I noticed about the lens mount is just how solid it is. It appears to not suffer from the "wiggle" effect you get from thinner lens mounts like Canon and Nikon lenses. Ryan explained to me that the mount runs deep into the body of the lens. 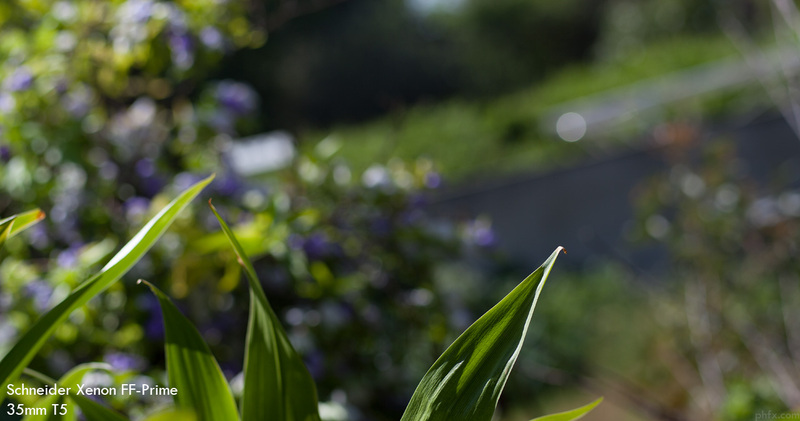 Iris design and blade count are pretty much create that unique look behind the out of focus image behind and in front of your in focus subject. There are 14 blades packed into the Xenon FF-Primes and they create a somewhat consistent shape and feel through the aperture range. Wide open the Xenon FF-Primes produce a fairly flat image without noticeable falloff. This is good news for both Mysterium-X and soon Dragon shooters. I was actually surprised by these results and was expecting more vignetting overall. 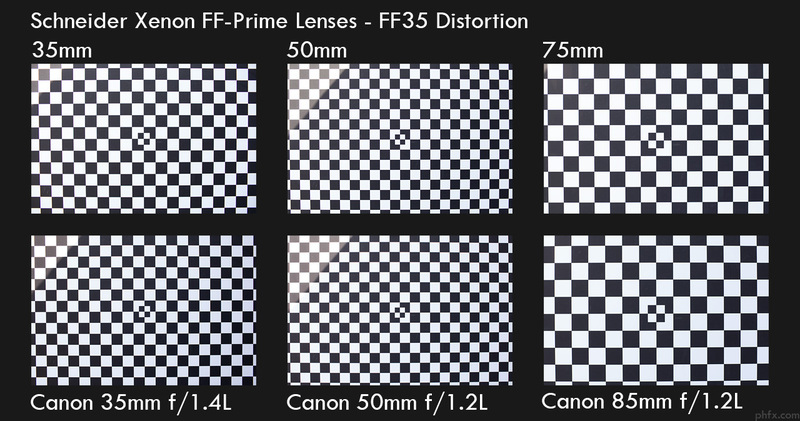 I wasn't expecting to see much distortion on this set, but I did decide to compare the Xenon FF-Primes to their Canon equivalents to see how they fair against similar competition. The 35mm Xenon FF-Prime has a bit more of a bulge compared to the Canon 35mm f/1.4L, but nothing that I feel would distract from the image. The 50mm and 75mm were fairly flat and looked good to me. One thing I noticed after tinkering with these lenses that I though was very nice was just how nicely color matched they are across the set and apertures. 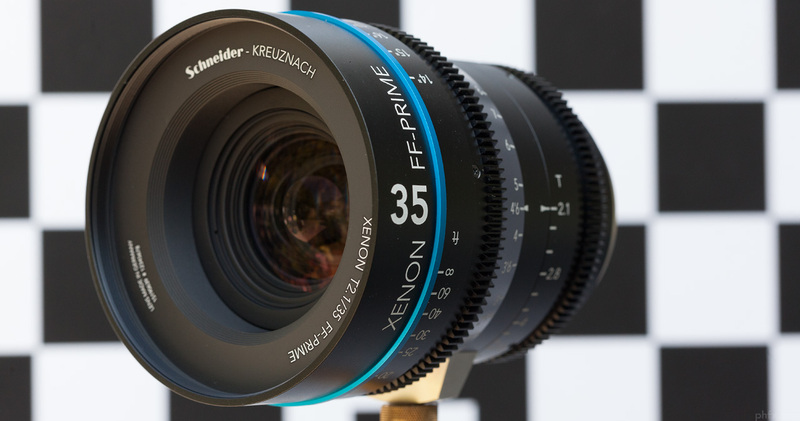 In that respect the Xenon FF-Primes are similar to the Cine-Xenars III. Schneider is certainly putting some effort in quality control to provide consistency across lens sets. Nicely done. I was also mimicking some general production workflow and swapping out lenses with and without a matte box. Pretty quickly the consistent size and gear spacing impressed the heck out of me. Lens changes don't require an adjustment of the follow focus position, same goes for users who use swing away matte boxes. That makes these ideal for run and gun or any sort of speedy workflow. This also can help keep your rig compact by using specific sized rods to your Xenon FF-Prime setup and you won't need anything longer or shorter for any reason. Nicely done. Pulling focus with 300 degrees of rotation is an utter joy for me and ACs will appreciate that as well. I plopped the camera down in front of a bush and as the wind blew the larger leaves around I was able to track them with ease and precision at T2.1. The big difference here against say modified still lenses or just lenses with shorter throws is that you don't have access to that level of precision. I found that I enjoyed operating with a speed crank attached which enhanced the precision and control even further while allowing more access to "different gears" when you need it. This is how I prefer to use cinema style lenses as well when self operating. Notice that there's no "jump" from image shift. That's really awesome at the price point that these lenses land in. There is a small amount of breathing, but I would describe this as pretty darn minimal. That's pretty impressive at this price. The Schneider Xenon FF-Primes provide nice usable image wide open. The resolving power is decent and in line with mid-range primes across the board. After experimenting for a bit I found that these lenses really sing around T2.8-T4. They have almost a classical feel with the current coatings and flare protection. Overall they render a slightly, very slightly, less contrasty image compared to the Canon primes I compared them too, which added to this classic feel. They are warm, but not warm like Canon K35s. They also have a "glow" about the highlights that's also similar to that classic feel. Which can be quickly wrangled at T2.8 if that's not the look you're after. 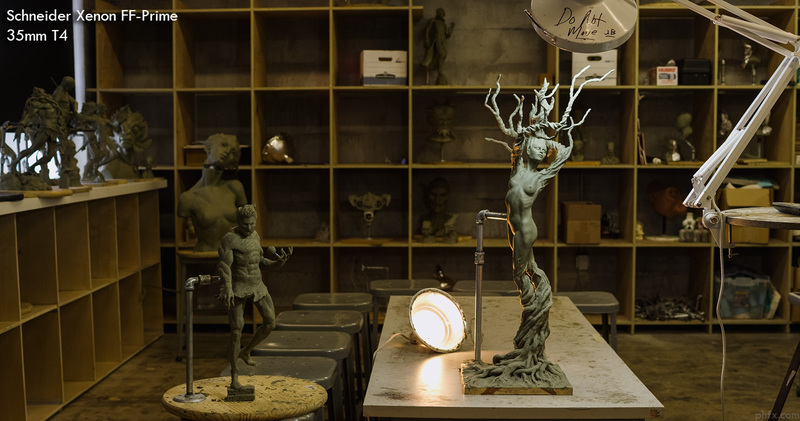 Here's some grabs from graded .R3Ds of a sculpture by one of the students at Gnomon, Brandon Love. WIP = Work In Progress. That's exactly what these prototypes are. These were created in Germany to have ready by NAB and get into the hands of folks like Matt and myself to give them a quick once over to see what could be better and what's working out nicely. 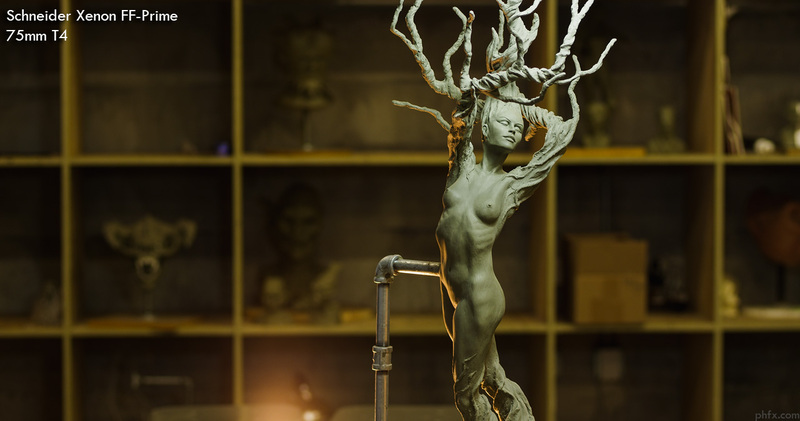 There's a few things that could stand to be improved on before the final production run in my mind. Improved coating formulas will help wrangle in that fringing/chromatic aberrations you see in the highlights. I'm able to get similar yet not as pronounced CA on the Canons at the equivalent apertures. I was noticing it more on the 35mm and the 75mm. Additionally, the prototype 75mm was a bit "tight" in the pull. When you watch the focus rack video you'll see a bit of movement on the return pull and that's due to the lens being a bit stiff. That's likely easily remedied via a more viscous grease or moderate cam redesign. I've used prototype glass before and this is all stuff that can be hammered out before the production run. It's no secret I'm a Red shooter and the Dragon sensor is pretty much around the corner. With it's larger sensor and my fondness for VistaVision/FF35 as a format a lens set like the Schneider Xenon FF-Primes is extremely alluring to me. 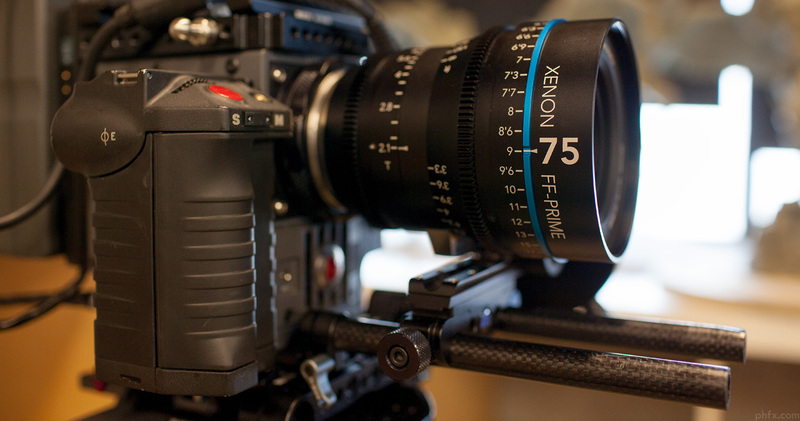 Also, at this price point and performance level the Xenon FF-Primes are pretty damn hard to beat. I would choose these over the Zeiss CP.2 as the Schneider's feel a bit more solid and are from the ground up designed for cinema use and show it. I'm really hoping to take a look at the final production version in a few months, but I would say purchasing this set is a no brainer. 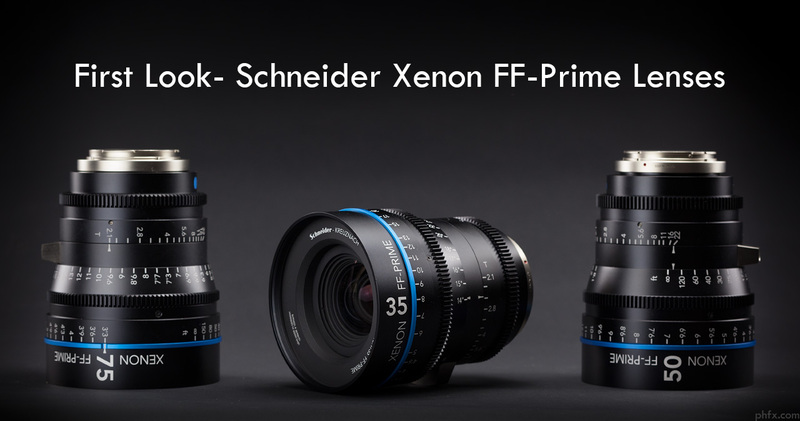 Down the line, it would be great for Schneider to flesh out the range of the Xenon FF-Primes with additional focal lengths. Currently in this price bracket and range of lenses nobody is really offering a full set with consistent apertures. I imagine we'll see a 25mm first, but an 18 and 100 macro would be impressive to say the least. 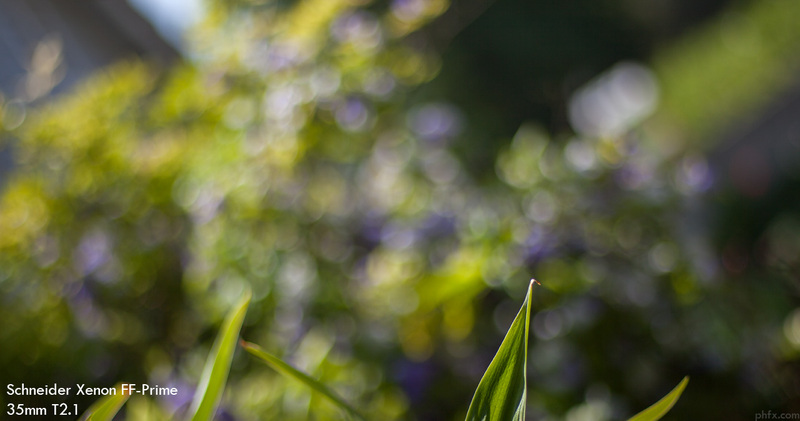 I'm actually pretty smitten with the 75mm Xenon FF-Prime as is. It's a focal length that's been rather illusive in this range. A bit more punch than a 50mm, yet not as much separation as an 85mm. I've always loved that length and really happy they have included it in this set. Schneider overall has been impressing me a lot lately. These Xenons fit right in line with what their bigger brother, Cine-Xenar III, is all about. The price to quality ratio on their cinema primes is extremely attractive for owner/operators and rental houses. Great review. Planning on checking them out at NAB. Hopefully i'll run into you there. Nice review Phil. These look really promising. Another fantastic review, thanks Phil. I really hope they bring 18mm and 100mm MACRO ! set of 18,25,35,50,75,100 macro and 135 would be fantastic for freelancers . I have been interested in these lenses and following their progress for a while. I love that there is no "wiggle" on the EF mount. That is precisely what I hate the most about the CP.2's. They look much more solid as well. It seems they produce images which are more contrasty than the Xenar III's (and the sets before them). Lastly, wondering what their resolving power (lpi) is. Perhaps Matt Duclos can answer that? Thanks for sharing Phil. Hopefully they will have more focal lengths ready as well come release date.